Since 1978, the Sons of the Desert has held an international convention every two years. 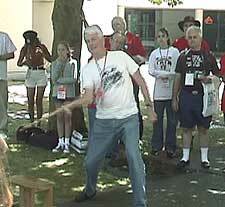 The 12th International Convention, dubbed "Sea-Tac 2000," took place in Tacoma, Washington July 20-23, 2000. Delegates from around the world convened to honor the memories of Stan Laurel and Oliver Hardy. This report was provided by Way Out West Tent members,daily from the convention. The convention began just past noon with a ribbon cutting ceremony, in the lobby of the Tacoma Convention center. 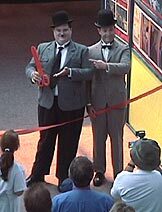 Laurel and Hardy look-alikes cut the ribbon, after being introduced by convention hosts Jack and Cathy Ledbetter Taylor. 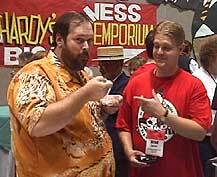 Members of the Beau Hunks tent have recreated the Hal Roach Studios back lot in the lobby of the convention center. Two film rooms opened shortly thereafter, and will remain open daily from 6 AM to 2 AM (with a break during the evening banquets and activities). One room is showing Laurel and Hardy films while the other is showing other Hal Roach shorts. Way Out West's Dave Griem is one of the projectionists throughout the convention. During the afternoon, we attended our first of several celebrity discussion sessions, where Edith Fellows took questions and answers about her career. She spoke of her work with the boys in Fra Diavolo, in Our Gang comedies, and her screen debut with Charley Chase. Gino Dercola presented a seminar shortly thereafter, on collecting L&H memorabilia. He gave information to both novices and experts alike, with help on where to find items and an overview of the numerous items that are available. A Billy Gilbert sneezing contest was conducted between seminars. Then our own Bob Satterfield gave a presentation on finding L&H costars. He presented around 100 slides showing the costars that he and others had found over the past four decades, showing how they looked when they attended a Sons of the Desert meeting or convention. He also gave a brief story on how each of the celebrities were found. 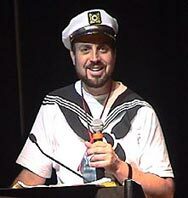 That evening we attended our first banquet, the "Saps at Sea-Tac Buffet." After the meal, we were treated with live musical accompaniment of scenes from Laurel and Hardy films by the "Bow Honks" quartet. We also had a traditional "Parade of Tents," where members of each tent in attendance paraded across the stage and briefly addressed the audience. An auction of 25 paintings done by Rosina Lawrence was then conducted, to raise money for the ITJ and Sons Literacy Project. The evening concluded with the traditional late night opening of the "Dealers Room." Today, we arose to an early meeting of the Grand Council. The recommendations made at the "Fixer Uppers" meeting held in Chicago last summer were presented to the council, and votes were cast on several of the more clear cut resolutions. There was great debate on some issues and not enough time to come to a satisfactory conclusion, so most of the resolutions were tabled for the time being so that convention bids for 2002 could be made. Rick Lindner from Columbus, Ohio's Perfect Day Tent made the first bid, followed by a bid from Steve Brown for Nashville, Tennessee. Four hour-long question and answer sessions took place today with the celebrities who are attending the convention. First up was Patsy Britten, who discussed her radio career and her film career, which included work in Our Gang. Patsy lives in the Seattle-Tacoma area and this is the first convention that she has attended. Peggy Cartwright was next, first showing a video then taking the stage to discuss her appearance in the first five Our Gang films. This is also Peggy Cartwright's first convention. Dorothy "Echo" Deborba also took questions and answers about her work for Hal Roach in the "Gang" and other series (including two with the Boys). Finally, Gordon "Porky" Lee spoke to the crowd about his career in Our Gang and his memories of the Hal Roach Studios. There were several contests today, including a hand grenade throwing contest in which one contestant had to throw a water balloon over a tall barrier and then be caught by another contestant, neither of which can see each other. There was also a "Putting Pants on Philip" relay race and a glider toss, where paper airplanes were thrown from the second and third stories of the convention center lobby. The most popular of the convention contests is probably the Pee-Wee Contest, which was held at noon. Way Out West Member Ken Runyan was the first place winner. The evening's banquet featured many guests in costume. Videos sent in by the tents were shown during the meal, as well as some videos produced by out host tent. Entertainment for the evening was presented by "The Gentlemen Jugglers," who brought the crowd to their feet by the end of the performance. A raffle was conducted at the end of the evening. The "Dealer's Room" was open throughout the day, and films were shown in the film room all day and late into the night. 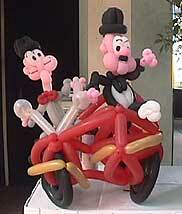 The L&H balloon figures pictured above were done by Scot Kelch. Roger Gillette is shown playing Pee-Wee. Today it rained for the first time during our stay here in the Seattle-Tacoma area. This morning's Grand Council meeting began with a vote for the 2002 convention, which will be hosted by the Scram! tent in Nashville, Tennessee. Bob Satterfield proposed a new flower fund program, in which tents will adopt a star and provide flowers for their grave sites. A new North American Grand Council was elected. Henry Sorenson will be returning to the council along with new members Bob Satterfield, Brad Farrell, and Rose Lahiff. The three European members of the council will retain their positions until a vote can be taken in Europe next year. A presentation was made by the editors and treasurer of the Intra-Tent Journal, explaining why the ITJ has not been published because it lacks the funds necessary to print and mail the current issue. Bob Satterfield then gave a slide presentation on the Laurel and Hardy locations in Los Angeles to a packed meeting room. The celebrities then reconvened for a group questions and answers period. The traditional trivia contest was held in the afternoon. Way Out West members Bob Duncan and Ken Runyan were among the three first place winners. In the evening, we attended a live Vaudeville show at Tacoma's Pantages Theater. The show featured a Billy Gilbert type emcee and musical sketches featuring two very convincing Laurel and Hardy lookalikes (Michael MacArthur and Jamie McKenna). Sacramento's Rebecca Kane performed as Lola Marcel in several numbers. Live piano accompaniment to the film "Two Tars" was performed by Joan Chrislip. Afterwards, we returned to the hotel for an ice cream social. The film room remained open late and the many Sons stayed to watch films and socialize. This morning was the closing session of the convention. The dealer's room was open for a final few hours, and then the Going Bye-Bye Brunch was held. 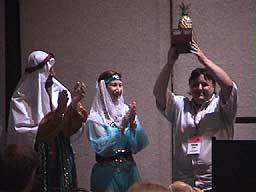 A pineapple statue is traditionally passed from the current convention host to the next host. A representative from each previous convention was on stage, and the statue was passed down the line. Finally, Jack and Cathy passed the pineapple to Steve Brown of the Nashville Tent. The celebrity guests returned to the stage for one last round of applause. Awards were given for the relay race, trivia contest, and other contests. Joan Chrislip returned to provide musical accompaniment to our final film, "We Faw Down." Then everyone began to say good-bye one last time. By noon, most people were on their way. Our thanks to Jack, Cathy, and the rest Beau Hunks tent for a great convention!